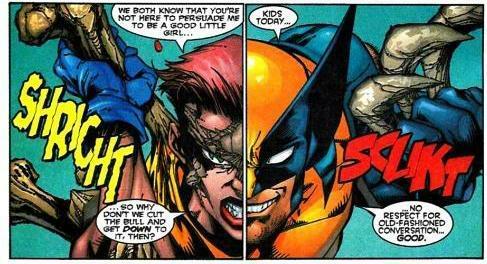 Wolverine-“Kids today… no respect for old-fashioned conversation. Summary: We start with a voice over by Marrow about how Storm doesn’t realize that things don’t just grow in the light but darkness can be just as nourishing. We see storm meanwhile in her empty greenhouse pruning back the dead leaves from her one and only plant, conversely in the dark basement that we see Marrow talking to wolverine a plant (looking quite healthy) has sprung up (plant represents Marrow no doubt). Wolverine throws his cigar at her and while he tries to reason with her she picks up said cigar and blows the smoke in his face and tells him to cut the bull because they both know he’s not here to talk. 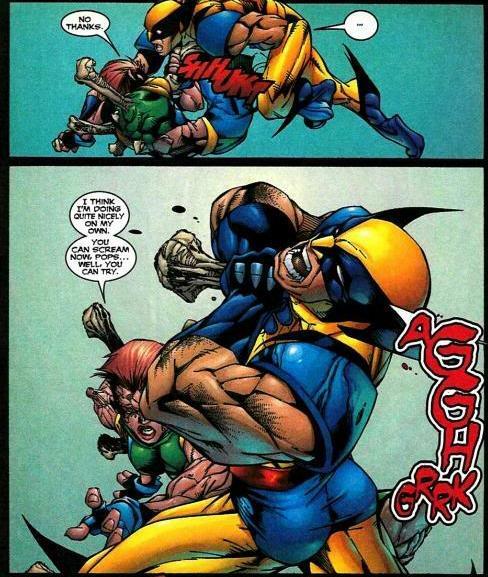 Wolvie smiles and decides yeah lets get it on! Outside her door Cannonball and Storm get into an argument about how they should deal with (what she deems the problem of ) Marrow. While Storm has already decided how to deal with her (sick wolverine on her), Cannonball wants to try a different approach, he wants to reach out to Marrow (on a human/personal) level. Their disagreement disintegrates into a verbal spat with Cannonball walking off. On the roof Beast and Joseph are fixing the mansion’s roof which cannonball had destroyed in his rush to get Cyclops medical attention (in X-men 70). The young blaster proceeds to fly past our would be architects Beast then makes a quip about Gambit and an obviously angry Joseph flies off. He settles into a walk on the grounds, where he finds Maggott and Cecilia Reyes. Joseph remembers how the young mutant Maggott called him friend in Antarctica and decides he will speak to Maggott about their connection when he is not as busy later on. 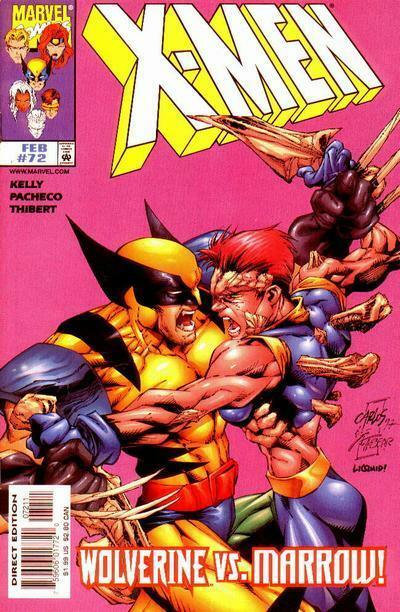 Back in the basement, Wolverine and Marrow, continue fighting. 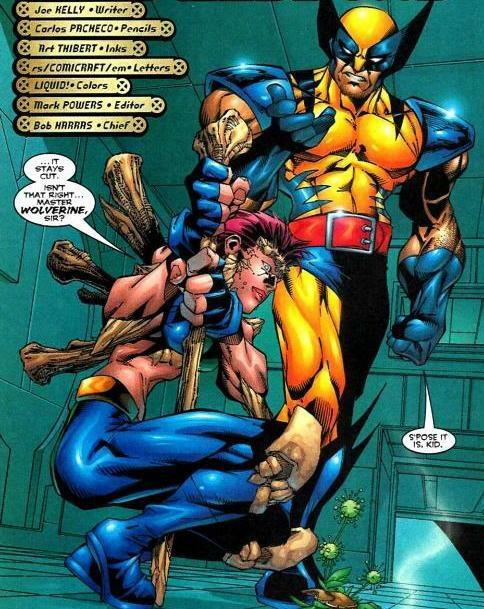 Wolverine has her outclassed and even stirs up her anger; he’s on the verge of winning, when he lets his guard down. Marrow seizes this opportunity to impale him through the throat ( with one very sharp bone shard). Unfortunately Wolverine enters feral mode and with no inhibitions he tries now in all earnest to kill Marrow. The rest of the team luckily hear his howling and rush to the Danger Room, first on the scene Cannonball knocks Wolverine out, thus saving Marrow’s life, She quickly bolts out of the mansion. Cannonball and storm get into yet another argument about her methods as he thinks Storm set Wolverine out to hurt (If not kill) Marrow on purpose. Marrow continues her frantic run, and returns to the sewers, to a sick and dying Callisto. And angry Cannonball leaves Storm and his teammates to contemplate a future with the team. Meanwhile, in Salem Center, the homeless man (from last issue) has been discovered maimed and mangled and the bloody trail leads to the Xavier school. In Israel, Sabra makes contacts with ambassador Gabrielle Haller and tells her that she has found out that the identity of Erik Lensherr believed to be the civilian identity of Magneto is a forgery. She also reveals that the man who created it is nearby and they must hurry to reveal Magneto’s real identity. Unknown to them however Magneto has already found the forger and kills him in cold blood. By the time Sabra and Gabrielle arrive it is too late. Magneto has returned and erased his last connection to the Erik Lensherr identity (Now who the hell is Joseph then?). 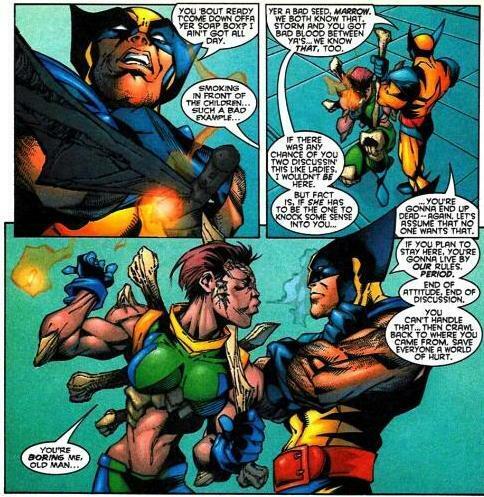 Some one shuts Wolverine up! Man that hairy little monster is good in small doses, back when this was written, him getting stabbed was cool, but by today’s Wolverines over saturation standards that is a beautiful thing seeing the lil runt laid flat! Anyway….Kelly draws a nice parallel between Wolvie and Marrow in this issue, we can see how wolverine knew what she needed and even what may be her motivation for sticking around at the mansion. Joe fleshes out her character in a plausible way, and while its still a ways off for her to be an X-man this issue exposes her insecurities and potential motivation and lays the groundwork for wonderful progression for her tenure on the team. Storm continues to make the right decisions for all the wrong reasons, kelly shows her inadequacies as a leader in a whole new way, she hates and fears Marrow and as a result comes into conflict with Cannonball and pushes Marrow further away. Cannonball continues to grow, he’s no longer feeling insecure around the x-men like when he just joined he’s standing up not just for himself but for those around him. Maggott and Cecelia get little panel time but they are still given good characterization and fleshing out. Symbolism- Storm trampling/killing a plant growing in the dark can be taken literally… that’s what she and wolvie planned to do to Marrow. Interpreted another way that Plant represented Marrow’s hopes and dreams which are crushed by Storm‘s decision to sick Wolverine on her. She has effectively stunted if not outright killed her development as a member of the team. Minor complaints here except that this is where Joseph and Magneto became two separate entities; Joseph then became uninteresting because knowing marvel’s track record he was a simple “C” like Ben Reilly. Disappointing to say the least. The Fabrication story with Magneto was never followed through either.